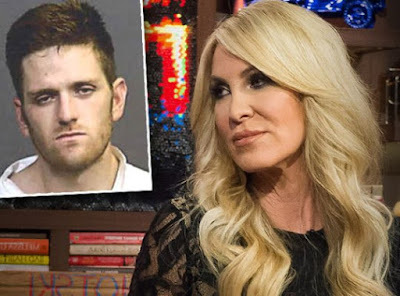 iRealHousewives | The 411 On American + International Real Housewives: Lauri Peterson’s Son Josh Waring Claims He’s Innocent In Attempted Murder Charges! Lauri Peterson’s Son Josh Waring Claims He’s Innocent In Attempted Murder Charges! Josh reveals that he’s “been prevented any inkling of getting any kind of fair trial” due to his criminal history and claims he knows the man who committed the crime. “They don’t care if they wrongly convict me, I’m a drug addict and not a productive member of society. I don’t think they care if I go upstate for the rest of my life,” said Waring. Waring reveals he even tried to get Dateline to perform a polygraph test on camera, but the former Bravo reality star says he’s hit roadblocks in every attempt he’s made to help prove his innocence. “I got the ball rolling [with Dateline]. They requested almost $10,000 to get cameras approved. The producer said she had never gone through so many roadblocks. So it’s been hard and they’re putting up bars everywhere I turn,” he revealed. As previously reported, Waring was charged with attempted murder after allegedly opening fire on two people in Costa Mesa and then leading cops on a wild car chase on June 20, 2016. Waring was eventually captured and charged with three counts of attempted murder and several other felony and misdemeanor charges. Jury selection began on Jan. 29, and Waring is still pleading not guilty. However, if found guilty, he could face several life sentences. Warning has had substance abuse problems for many years. If you recall, he was hit with a felony possession of a controlled substance charge and accusations of being under the influence — while locked up behind bars! According to court records obtained by Radar Online, Waring was busted with “pruno,” an alcoholic drink made from fermented fruit, ketchup, sugar, bread and other ingredients. As viewers may recall, Waring appeared on RHOC with his mom on the first four seasons of the Bravo hit reality series, until she decided to walk away from the show in 2009 for privacy reasons over Waring’s legal woes and drug issues. Despite Peterson leaving the Bravo hit reality series may years now, Waring partly blames RHOC for getting him into trouble with the law. While behind bars, Waring was hit with divorce papers from his wife Hannah. She said in legal docs that they split up in March 2015. His estranged wife also noted Josh's mom, Lauri Peterson adopted their four-year old daughter, Kennady Kaydence and both parents have no legal rights to her.